Ok, before I start listing complaints, first lets focus on the positives. There are a lot of things that Revolgear II does right - the aesthetics deliver a very believable illusion of playing a lost console or arcade shmup, XBox 360 joypad support is built in (using either d-pad or analogue stick), the inclusion of four craft each with different weapon systems results in the game being quite replayable and, well, it's a shmup isn't it? 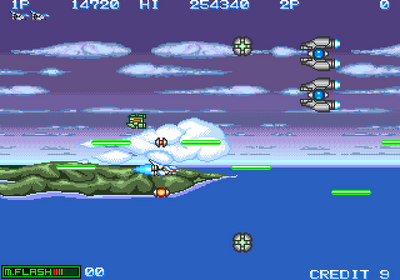 It even has those 'WARNING A HUGE SHIP IS APPROACHING' boss notifications, which are always fun. Unfortunately though, despite looking good and sounding even better, where Revolgear II fails is in the game balancing - especially with regard to the weapons and level design. Despite running the game's text file through Google Translate, there's no real story to speak of here - it's the usual 'giant alien ships have appeared in the sky, so we'll send out a single prototype ship out to meet and greet' type affair. 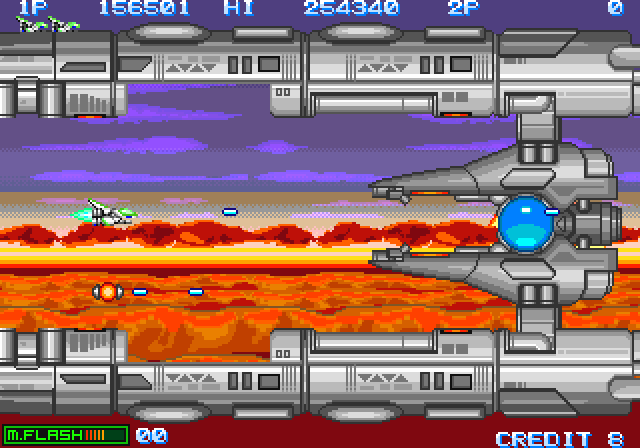 Typically, before long all hell breaks loose and the first stage (A Summer Day) introduces you to the alien aggressors in what is probably one of the more difficult out of the game's five short stages (based on Earth, Mars and beyond). 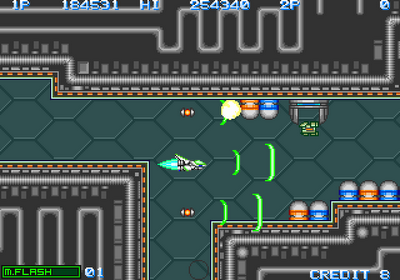 Power-ups dropped by enemies and capsules cycle through speed increase (white) and the different weapon types (red, green, blue) - and there are also collectable options or satellites that either follow your ships movements or stay in formation either side (depending on the ship selected by the player). But the thing to note here is as soon as you've swapped from your initial two-bullet pea shooter to a better weapon, you'll be pretty much invincible for the rest of the stage. 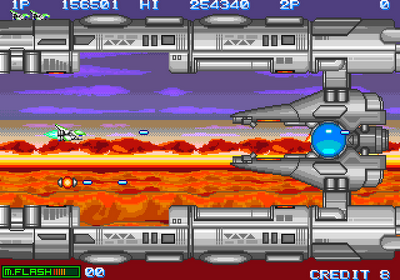 The weapons are ridiculously over powerful, destroying both enemy fighters *and* bullets as soon as they enter the screen, meaning that the only challenge is in avoiding the occasional piece of indestructible scenery or the dreaded pink power-up that downgrades your fighter back to its original state. At least the bosses put up a little resistance before succumbing to the wall of plasma spewed out from your fighter, but it's still barely enough to keep a shooter veteran amused for more than a few seconds. Unsurprisingly, the boss battles are probably the best part of the Revolgear II. However, I'm not saying they are exceptional by any means, but rather that they are the best part of an otherwise very average game. They are not without fault though, again mainly due to balancing issues. 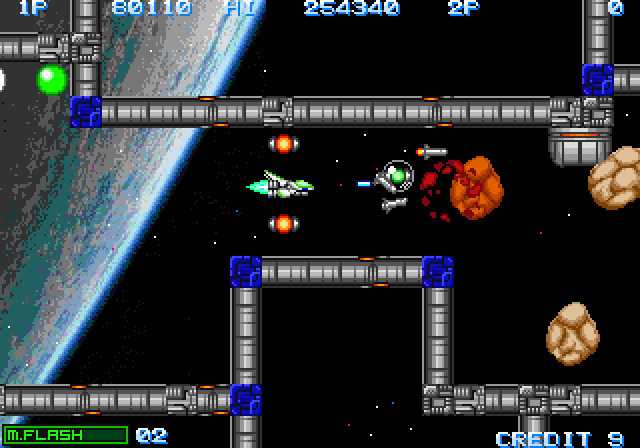 For example, aside from the true end boss the level three boss is harder than any other (tsk tsk), and the level one boss cannot actually be shot in its weak spot if you're using a wide beam weapon (very naughty). 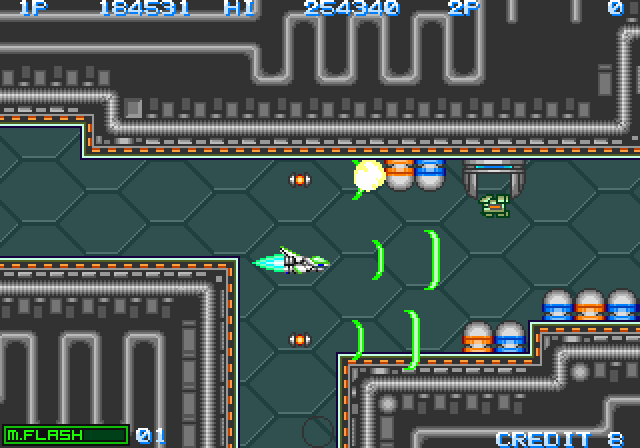 Other bosses, such as the giant Thunderforce rip-off mega-ship that comprises of the entire of level 5 are far too weak to be satisfying to kill (you can actually park your fighter inside the ship's muzzle behind where it fires from and thus only have to worry about avoiding its beam weapon). These issues just scream of poor design. Oh, and the standard final boss brain just sits there doing nothing while you pummel it with projectiles of hot death. Fun. In all, Revolgear II a bit too easy to beat for its own good. 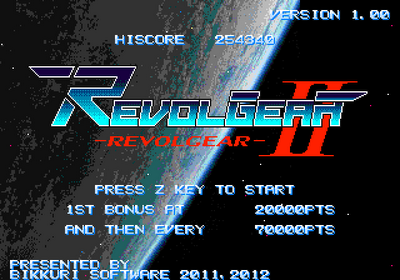 That is until you clear the game on one credit and are confronted by the true final boss - the mighty Revolgear. This is probably the only saving grace the game has - the last boss is so insanely hard to beat that it will chew through your nine(!) credits and lives faster than you can cry out "WTF!?" in total disbelief. It's completely unfair, but the contrast between what is essentially a yawn-fest and the unexpected all-out chaos of this final battle is quite amusing, and it certainly scored a few guffaws here at the RGCD office. If it wasn't for this silly closing encounter then I'd drop a score of 2/5, but because it has a sense of humour - intended or not - I'll be generous and give Revolgear II a 3. Not really recommended for connoisseurs of the shmup genre, but casual fans may get a kick out of inevitably beating the game on their first play - especially so if they make it to the true ending. The instructions for Revolgear II are given in Japanese, so you may find the following keyboard commands useful. There is no two player mode (I'm not sure why the HUD indicates that there is). Download the game here (from Bikkuri Software blog).